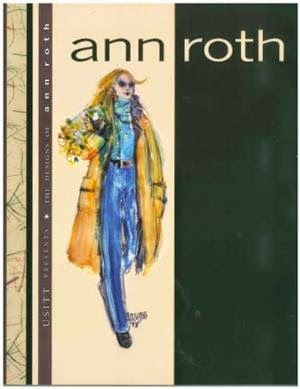 The Designs of Ann Roth, a new monograph that the legendary costume designer helped launch at USITT 2014 in Fort Worth, is now available at USITT's online bookstore. The book, by Holly Poe Durbin and Bonnie Kruger, is the latest in a series of monographs published by USITT to document America's best living theatrical designers. The Designs of Ann Roth contains more than 100 renderings and photos of Roth's work from her 50-year career costuming for stage and screen. It also describes her methods and close collaboration with friends like actress Meryl Streep and director Mike Nichols, who wrote the book's foreword. Roth had a starring role at USITT's 2014 Annual Conference & Stage Expo in Fort Worth March 26-29. She accepted USITT's 2014 Distinguished Achievement Award in Costume Design, signed dozens of copies of the just-released book for a long line of fans, and joined a panel discussion with five other 2014 Distinguished Achievement winners, including fellow Tony winner, scene designer Eugene Lee. At Roth's award presentation, co-author Holly Poe Durbin thanked her for allowing "two perfect strangers to stalk you in cold blood" for the book. "'Stalk' is a key word," Roth joked. The Designs of Ann Roth takes her from her discovery by Irene Sharaff in the 1950s, to Broadway work with Nichols in the '60s, to the ground-breaking films Midnight Cowboy (1969) and Klute (1971), which established her genius for "character costuming." Roth told a USITT audience how she helped Dustin Hoffman turn into Ratso Rizzo for Midnight Cowboy by dressing him in "a purple Dacron suit I found on 42nd dipped in green dye" and special weighted shoes that made him limp. "So the actor has been flown in overnight and he's incredibly cranky," Roth said. "And I tell him we're going to go in the dressing room and create a character." She had him try on the suit, then several shirts. "And I had asked for rotten suspenders. I told him he had to have filthy fingernails and a class ring he stole from somebody." "And suddenly you look in the mirror and you both see that there's someone in the mirror who's not Dustin Hoffman and not me," Roth said. "It's the character, and you have to just stand back and let it breathe. And that happens on every single thing I've ever done." Roth's body of work, as documented in the monograph, ranges from meticulously researched period costumes for movies like The English Patient (1996) -- which won her a Best Costume Design Oscar -- to portraying historic figures like Nicole Kidman as Virginia Woolf in The Hours (2002) and Streep's Julia Child in Julie and Julia (2009). USITT, the United States Institute for Theatre Technology, is the national association for theatrical designers and technicians. Its eight previous monographs on significant American designers -- including The Designs of Tony Walton, The Designs of Ming Cho Lee, and The Designs of Carrie Robbins - also are available at www.usitt.org/store.